I read this book, The Last Jews In Berlin, whilst staying at a writers’ residential at Wannsee lake within view of Haus der Wannsee-Konferenz, the villa where in 1942 the Nazis planned the extermination of European Jewry. In fact, when I finished the book I cycled over to the villa, my second visit in thirteen months, and am pleased to say that seventy years after that unconscionable event visitors, especially German schoolchildren, throng to the house, now a museum, to learn about the meaning of evil. Before going to Berlin I met 94-year-old Erna de Vries, a concentration camp survivor, who was speaking at the same series of talks to students in northern Germany as myself. 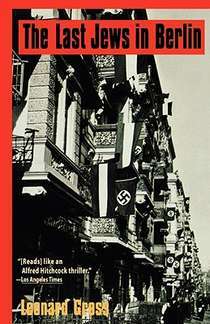 Leonard Gross, a journalist, was not the original writer of this book about those 4,000 who remained in Berlin after 1943 (when Goebbels ordered the arrest of the remaining Jews) and who were hidden by ordinary Germans, Gentiles, who risked execution if they were caught harbouring them. The book was begun in 1967 by Eric Lasher who advertised in a Jewish community newspaper published in Berlin, and who received eighteen replies from both men and women. But Lasher was unable to finish the book, one reason being that he found the material so upsetting that he developed a stammer. And so, it was Gross who finished it in 1981. When Hitler seized power in 1933 there were 160,000 Jews living in what was then the politically liberal Berlin. Many emigrated as the situation deteriorated; others committed suicide, many were disappeared and murdered; and some went into hiding. This powerful book tells the story of twelve of those who were in hiding, were on-the-run, only a few hundred of whom survived, and what a spine-chilling story it is. Goebbels complained that in the final major round-up they had missed about 4,000 Jews because some of their employers forewarned them. Wilhelm Glaser was one of the most daring escapees of the lot. He came home one night to find two hefty Gestapo waiting in his apartment. Wilhelm thought: “If God is on my side, something has to happen now. Once I’m in the car, I have no chance.” So, he pushed one of the men aside, bolted down the stairs, then threw his suitcase at the other one chasing him, and got out the door before they could open fire. Some months later he was caught and arrested but whilst awaiting transportation to Auschwitz he escaped again. The resistance portrayed in the book is not that of sabotage, political assassination or guerrilla actions but defensive work – mostly attempts to save the lives of endangered persons, Jews and political dissidents. The very wealthy Countess von Maltzan emerges as one of the great heroes of the war. She worked in cooperation with the Swedish Church in Berlin to provide a safe haven for Jews, deserters and forced labourers. She eventually married one of those she was hiding, the author, Hans Hirschel, but they divorced after two years. However, they remarried in 1972, and Hans died in 1975. After the war, and probably as a result of PTSD, she experienced major breakdowns and became a drug addict. But in 1981 she opened her own veterinary practice in Berlin, often treating sick animals for free and worked to improve of the living conditions of immigrants. In 1986 Israel named her as a Righteous Among The Nations, an award given to non-Jews who risked their lives to save Jews from extermination. Incredibly, one Jewish woman managed to stay free because she was helped by a childhood friend, the sister of Horst Wessel, the extreme Nazi, assassinated by two communists, who wrote the Nazi Party’s official song and the secondary anthem of the Third Reich. Other stories tell of sympathetic policemen who supplied food to Jews in hiding, and even in one case that about a Gestapo agent who helped a woman in hiding maintain her secret.